You may have felt as though you were going to faint the first time you gave your child an insulin injection, and you may still be a little shaky. You may not believe this, but there will come a time, sooner than you think, when insulin injections will become so rou­tine that you’ll hardly realize that you’re sticking a needle into your child. Very few people already know how to give an injection, so it is extremely important that you learn from a professional: a nurse or a diabetes educator. 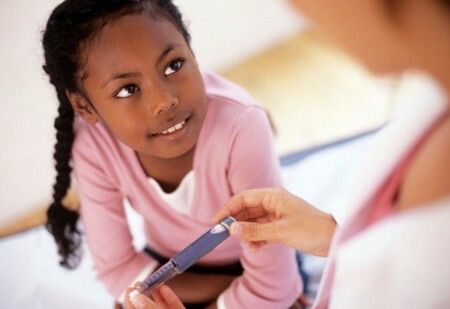 If you are seeing a pediatric endocrinolo­gist, most likely there will be someone on staff to help you. If not, you will probably be referred to such a person, who has experi­ence in dealing with nervous parents. Ask as many questions as you need to when you are being taught (there is no such thing as a “dumb question” when you are dealing with your child’s health), and don’t hesitate to call when you have more questions. If you need another teaching session, ask for it. Until the child gets used to it and no longer thinks of an injec­tion as painful, put an ice cube on the site for a few seconds. It will desensitize the skin and might even be fun for the child. Most of the “pain” associated with an injection isn’t actually pain; it’s fear, anxiety, and anticipation of pain. Therefore, if you present a calm, matter-of-fact demeanor and do not inti­mate that this is going to hurt, your child will quickly adopt your attitude. Let other family members give the injection once in a while. This serves two important functions: It keeps you from being the sole giver of needles, and it teaches others the skill. Try using some of the alternative insulin delivery systems, such as a pen injector or air jet infuser. Your child may think they’re “cool,” and in many cases they are easier to manipu­late. You might also try an injection aid that fits over the end of the syringe (it hides the needle) and rests against the skin. It is designed to make certain that the angle of injection is correct, and is good for people who tend to be squeamish about injec­tions. They are advertised in diabetes magazines and can be purchased through the mail. Use the shortest, finest gauge needles you can buy (the higher the number of the needle, the finer the gauge). This minimizes pain. Once the insulin has been drawn into the syringe, give the in­jection quickly. Don’t diddle around with long, drawn-out preparations, and don’t slide the needle in slowly. A quick stick is the least painful. It is difficult to say at what age children can be taught to give themselves insulin injections; by nine or ten, they can do it if you or another adult supervises them, and some children can manage it even younger. By age twelve or thirteen, they should be able to be on their own with the injections—realizing, of course, that you will be there if they run into trouble. At whatever age you decide to teach the skill, it should be a shared responsibility for the first few weeks. Teaching children how to measure the insulin, draw it up into the syringe, and insert the needle won’t be entirely strange to them, of course, just as driving a car is not entirely strange to ado­lescents the first time they get behind the wheel. The experience is new, but much of the knowledge is already in place. As children watch their parents accelerate, steer, brake, and maneuver in traf­fic, so too they watch their parents test their blood glucose, calcu­late insulin dosage, and push the needle through the skin. As with learning any new skill while a child is growing up, there will be periods of advance and backsliding. Some days a child will feel fiercely independent and will barely tolerate your presence in the room during the injection. Other days, you may be asked to do it. This back and forth is a natural process of growing up, and just because you have taught the technique does not mean that your child will get it right every time. This is why you need to supervise the process until you are absolutely certain it can be done alone.